Patra's Other Place: Wildlife Art exhibition and a renewed interest in drawing. Wildlife Art exhibition and a renewed interest in drawing. Eltham and the surrounding suburbs have dozens of art galleries. One of the newest ones is called The Light Factory Gallery, and not only is it close to us, the exhibitions are free! My friend Glenda (who is an artist) and I go to the Light Factory for most of their exhibitions, and last week we viewed the current one which is on until 4th September. It is called "Wild4Art" and has a collection by four artists whose passion is Australian wildlife, birds in particular. If you click on the link, it will take you to the Gallery website, where you can click on each name and see a sample of their works. One of the artists is Janet Matthews, who is a charming lady with a bubbly personality and a unique way of drawing birds that shows individual personalities - very cute! 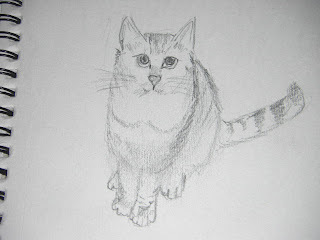 But not just cute - her pencilled drawings are exquisite. So when we heard Janet was conducting a workshop at the Gallery in October, on how to draw birds, Glenda and I both booked in for it. I seem to be better at drawing people than flora and fauna. I sketched my left hand here, and drew some faces from an art text book. See what I mean? These poor pastel drawings look nothing like the beautiful Rainbow Lorikeets that were posing for me on the birdfeeder yesterday! I visited my friend Helen today and we spent the sunny afternoon in her garden. She read a book while I sketched a Banksia plant nearby. Helen thought this was good. She said "You can see immediately what it is." The highest compliment, lol! Tiger obliged by sitting and gazing at me with that unblinking stare peculiar to cats. 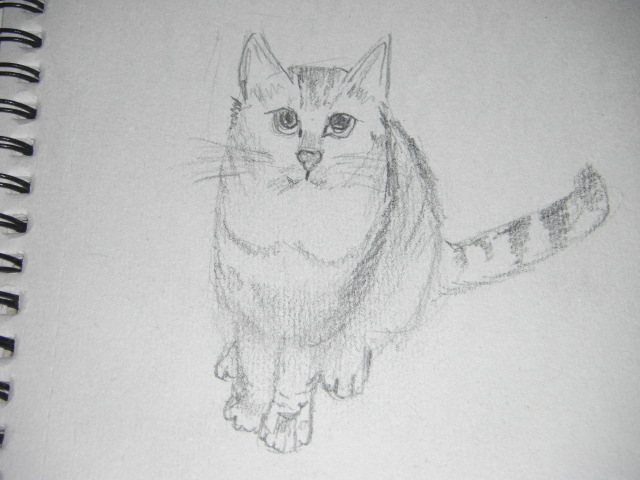 It isn't a bad likeness, and I'm pleased with it, as I don't usually have much joy drawing cats, as much as I love them.